Built with high-quality water resistant materials, colorful lights is well enough to support your activities. fountain or punch bowl. You can also use it at party, wedding decoration or as the land lamp. The item will bring you the romantic and warm experience with the unique spherical design. You can also make it as the ornamental with string to hang it. during the day - or you may use the on/off button located on the bottom to turn them off. 1.Be sure to charge fully for a minimum of 10 hours in full sunlight before first use. 2.Each full charge will light from 6 to 10 hours. 3.Be sure to turn the switch on before you charge. The water pressure is too high and shock loose the sealing layer of the product, so that to affect or damage to the product! Suggestion: for long term use, get a suitable tray so as to avoid water get into. 【Solar Powered】 Solar-Powered Floating Lamp, when press the switch and it will automatically get charged during the daytime (enough sunshine), ON/OFF switch placed on the bottom of the solar light. Energy-saving and environment-friendly. 【Light Sensor Control】These come equipped with a photocell that will automatically turn the ball on at night and off during the day - or you may use the on/off button located on the bottom to turn them off. 【Green Material】Made of green plastic ABS, it is enough green to our environment; and water-resistant performance ensures the maximum durability wherever you go. 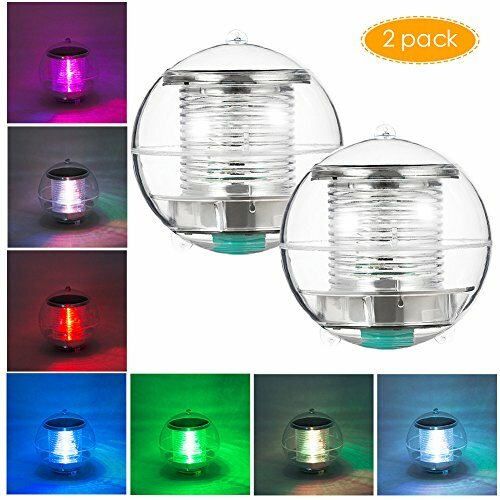 【Color Changing】 Ultra bright 7 color automatically changes (Red, Yellow, Green, Blue, White,Orange and Purple), create a unique lighting experience in your garden. 【Warranty】 If there is any quality problem about our floating lights, simply contact us and we'll rush you free replacements (FOR LIFE!). You take NO RISK by ordering today!